← How Do We Help Our Teens? When dealing with children/teens with ADHD it never seems ‘simple’ and research is showing that, in many cases it’s because there is more going on. This NEWS Medical Life Sciences article, Hardik Patel, M.Pharm takes a look at some of the things that may also be going on. With more than 60% children with ADHD reporting one or more co-existing mental health conditions, it is easy to see that this issue is much more complicated. Mood disorders, conduct disorders and learning disabilities are all common issues that those with ADHD may also be dealing with. We need to be sure that we take a ‘whole person’ approach when addressing our client’s needs. Self-esteem and self-confidence can suffer when a child/teen feels different than their peers. They may struggle with isolation and even bullying. We need to be very vigilant to make sure they get the help they need to deal with everything they living with. One of the great things about work with horses is that you can work on multiple concerns at once. 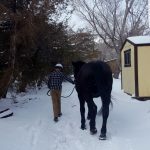 Let’s consider the simple act of haltering and leading a horse. Clients may have to deal with anxiety. Horses are big and powerful. They can be intimidating. So we talk about how to stay safe and we may encourage clients to do some deep breathing exercises to help them become more centered and calm. 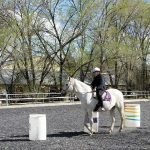 Clients will need to focus, listen, process and follow directions when haltering their horse. They may need to accept/ask for assistance. They need to continue to be focused while leading and work on setting/maintaining safe personal boundaries. And of course they have to practice being a ‘good leader’. All this, while simply haltering and leading the horse. Make sense? 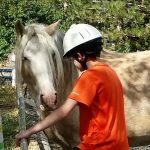 At Nevada Equine Assisted Therapy our team of Qualified Mental Health Associates (QMHA) work one-on-one with children as young as 4, teens, adults and even seniors. 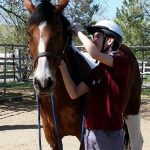 Through work with horses, we can address a wide range of social, emotional, behavioral and mental health issues. 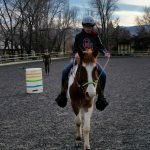 We have a diverse herd of incredible horses who are able to help clients find the path to a happier, healthier and more balanced life. If you or someone you know are struggling with ADHD or other issues, we are here to help. Give us a call or send us an email and we can schedule a visit. 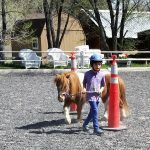 We will show you around the ranch, introduce our wonderful herd, learn more about what you are dealing with and share how we may be able to help. This entry was posted in ADHD, Anxiety Disorders, Asperger's, Autism, Children's issues, Depression, Mental Health, OCD, ODD, PTSD, Reactive Attachment Disorder, Sensory processing issues, Teens. Bookmark the permalink.